In unity with the Days of Action to Stop Drone Warfare, Mouths Wide Open is unleashing its own squadron of drones for peace and invites you to join with us by making and launching your own! Inspired by the 1,000 Paper Cranes for Peace, we wanted to create something that was both socially engaged and visually evocative. We encourage you to download our template so you can print, construct and then dispatch your drones around your neighborhood, the country, the globe – as everyday reminders of the ongoing horrors of war and the expanding culture of surveillance. In the same do-it-yourself, collective spirit of our Army Men Project (2005-2010), we hope you will assemble and disperse these silent, under-the-radar paper protests everywhere – at the mall, on a gas pump, at the office, in a bookstore or movie theatre, at your post office, in public restrooms, at the 7-11, in the produce section of your grocery store … to foster dialogue, action and resistance to what is being done in our name. 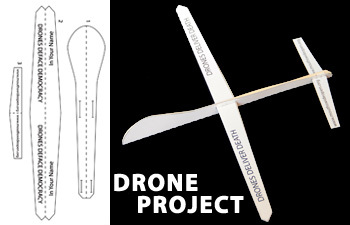 Just click on the model drone above or here for the template/instructions, and for more about taking photos of your drones in situ and sending them, along with your comments, to us. There are many groups/coalitions actively involved in ongoing efforts and actions to end drone warfare and drone spying. Please check out www.knowdrones.com and www.droneswatch.org, which each have links to other organizations – and, of course, stay in touch (as we do) with Code Pink www.codepink4peace.org. 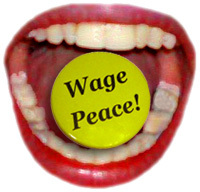 Mouths Wide Open is an ad hoc group that came together in early 2002 to raise our voices and act on our convictions. While many of us are theatre artists, visual artists, musicians, singers, actors and writers, we're also bookkeepers, students, carpenters, researchers, teachers, fact-checkers, scientists, bike messengers and flea market mavens. We're committed to fostering dialogue, creating and disseminating materials that spread the message of alternative thought, and encouraging others to join together in a similar spirit. We recognize the need for community and organization, for resistance and action, and for the pooling of time, energy and resources. There is strength in numbers. Our commitment to working for change is ongoing. Something can always be done. Our motto – "The job of a citizen is to keep your mouth open." – refers to the serious, engaged, 24/7 job of being a citizen. Democracy can't flourish without active citizens enriching and enlivening its fundamental principles; and our global community can't survive without each of us seeing ourselves as global citizens, committed to fighting for a sustainable, equitable and creative world. Please download our fliers, stickers, posters, essays and other materials.